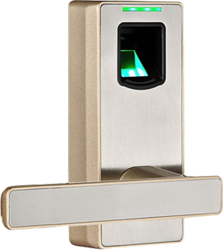 Providing you the best range of door fingerprint lock with effective & timely delivery. 1. Perfect combination of fingerprint and password, 3 ways to unlock. you can either use fingerprint, password or the mechanical key to open the door; independent mechanical key can be used if the electronic parts fail.